An examination of British policy with regard to European Unity during the period 1945 to 1949: Why did Britain did Britain diverge from the emerging European Community and was it justified in doing so? 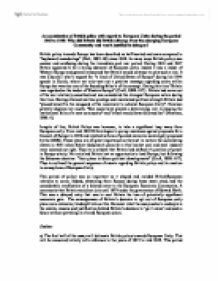 An examination of British policy with regard to European Unity during the period 1945 to 1949: Why did Britain did Britain diverge from the emerging European Community and was it justified in doing so? British policy towards Europe has been described as half-hearted and even compared to "haphazard meanderings" (Dell, 1995: 69) since 1948. In many ways British policy was unclear and confusing during the immediate post war period. During 1946 and 1947 Britain appeared to be a strong advocate of European unity; indeed it was a leader of Western Europe and generally assumed that Britain would continue to play such a role. It was Churchill who's request for "a kind of United States of Europe" during his 1946 speech in Zurich, whom not only sent out a positive message regarding union within Europe but was also one of the founding father's of the concept. During this time "Britain was regarded as the leader of Western Europe" (Croft, 1988: 617). Britain had come out of the war relatively unscathed and was considered the strongest European nation during this time. Having attained wartime prestige and maintained political strength Britain had "placed herself in the vanguard of the movement to achieve European Unity". Newman potently displays her assets: "She could have played a determining role in shaping the institutional form of a new community" and "others would have followed her" (Newman, 1996: 6). In-spite of this, British Policy was however, to take a significant leap away from European unity. From mid 1948 Britain began to put up resistance against proposals for a Council of Europe in 1949 and rejected notions of pooled economic sovereignty proposed by the OEEC. These years are of great importance as they set in motion the culminating events in 1951 when Robert Schuman's plans for a free market coal and steel industry were rejected out right. Thus its is evident that Britain had shifted it's position of power in Europe utterly. ...read more. From the onset it is evident that Labour intended to pursue it's discourse primarily with national interests at heart. The government was held to its pledges and radical manifesto included in which lay commitments for implementing a welfare state and the socialization of basic industries and services such as transport, health and education (Shlaim, 1978). Political and economic sovereignty was key to enabling the fulfillment of these pledges. In apathy of Labour's position, Croft (1988) notes the "government could not have accepted the approach espousing European unity without sacrificing many important policies" (Croft, 1988: 618). Purely in terms of pragmatic consideration it can thus be argued that the government was not in a position to participate in Europe. In doing this the very proposals that gained Labour a landslide general election victory would to some extent be neglected. -Thus, in defense of the government is the argument that the Labour party was maneuvered into a position where by even if it desired it could not partake an active role in the building of Europe. These pragmatic considerations perhaps justify Britain's caution with regard to the OEEC. For Croft (1988) comments, "economic sovereignty had to remain in London in order to implement the transformation of society". The government needed complete sterling independence to initiate the massive, internal, socialist changes it had proposed. The Labour government, as it took the reigns of power in 1945, had a huge under taking. For Croft sovereignty of Britain's economic sphere was an essential prerequisite for the successful restructuring of British society during this turbulent post war period (Croft, 1988). Notions of handing over Sovereignty Perhaps the prime reason for Britain's aversion to towards a participatory role in Europe was the prospect of giving up national sovereignty. Any handover of national independence, be it political or economic, has been vehemently opposed by successive governments through out Britain's history and the post war Labour government was no exception. ...read more. Thus, as the essay has highlighted, from the onset Britain/Europe relations were on a `wrong footing'. It is these beginnings that have continued to set the pattern of this relationship for years to come. 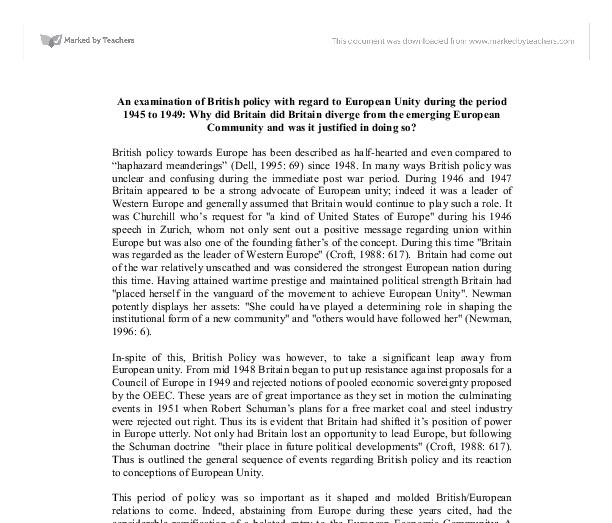 The second part of this essay endeavored to discuss the reasons behind diverging Britain/Europe policies. Of notable importance was Britain's untarnished self-perception of itself as a global power. Britain believed that it could go re-establish itself as a world power. This ideal would be rendered void if she pursued integration into a broader pooled European Community. More reaching than this explanation of European rejection was a shear despise of hading autonomy and sovereignty over to a federalist European body of governance. Historically Britain had never been accountable to a higher body and Labour was not going place the country in such a position now. The essay has sought to balance empathy of Britain's European policy with subsequent criticism. Hindsight tells us clearly that Britain should have joined a closer bond with Europe and that clearly Britain was wrong to abstain from European negotiation. Britain rejected Europe in search of a more glamorous global role that simply no longer existed. The British government's policy was also led in large part by the principle of handing over power. Perhaps it should have thought more in terms of the realistic and practical benefits that a united community could offer. To draw one final conclusion, so much of Britain's foreign policy was linked inherently with fear. Bevin splendidly purveys this fear with regard to a loss of sovereignty threatened from the formation of the Council of Europe; "If you open that Pandora's box you never know what Trojan horses will jump out" (Bevin, 1949 in Pilkington, 2001: 9). The British government feared a loss of sovereignty; it feared the implications of federalist rule and above all feared an inevitable stand down in global influence, stature and a retirement from the world stage. For all these reasons Britain sought to distance its political agenda from that of its own continent. ...read more. more homogeneous economic environment the single market will contribute to the right conditions for the EMU success. According to Ponti M. in 'The Single Market and Tomorrow Europe, p. 144, politically, the Single Market still is a key instrument through which the priorities of the Union can be delivered. They are both as bad as each other. Secondly, not all policy processes consist of cobbling together deals to satisfy the current complexion of political forces. The commission aims for co-ordinated forward planning, with a view to initiate not react, and look at medium rather than short term. should play rather than its existence5. However there emerged a need for the redefinition of the current relations between two sides of the Atlantic. In this redefinition process, or generally known as transformation, U.S. repositioned itself in Europe, by simply redefining the roles of the existing institutions. Becoming part of Trading Blocs. So despite being a key player in Europe at the time, Britain was not a driving force for supranational integration. The United States of America had very different motives for European integration to those of the European states. In the difficult years after World War Two Europe divided and two global superpowers emerged.